There's No Place Like Jones! Providing Superior Service since 1894! To whom it may concern, I want to take a moment to say Thank You to the Jones Motor staff. I have owned trucks for 13 of the last 18 years and have leased my truck to several larger companies and a few smaller companies without success. Either the freight was just not there or the rates where substandard or just plain cheap. I have been leased to Jones Motor Co since early June 2015 and could not be more pleased. The Mid-West recruiter Ms. Carol Faulkner was up front, honest, and definitely made me feel at home during the entire orientation process. And still 4 months later she is more than happy to take my calls and help with any questions or problems I have ran into. Jones is a box, flatbed and stepdeck company, As 1 of 3 RGN's the freight base was on the slim side to start, but now the Jones agents are building a good customer base for our freight. I get several phone calls daily and the rates are where they need to be. It’s great to be able to book loads at the house when you want your home time, or an area you would like to run for any reason. As a one truck operation, dispatch and settlements are a huge concern, it’s a great relief to know your settlements will be correct and on time. 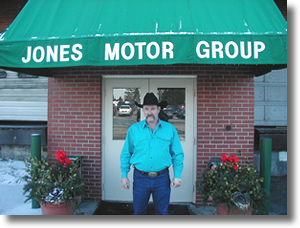 The Jones Motor staff as a whole go above and beyond to ensure you’re up and running, not sitting in a truck stop without a load. "Just want to say this is the best company I have ever leased on to. Here at Jones Motor they treat you like family. Working with all the agents they understand what we need out here. Colleen,Cherl,Pam,Cathy, Deb, Jenny and all the people in safety and all the girls who take care of the permits and paperwork in the office are great. And thanks to Randy Sutton who gave me a chance to come work for this great company. I can't say enough how great it is working here. I know that I can retire here. Thanks Again for all the hard work you do here . Thank you everyone here at Jones Motor. Your friend Terry Coonfield @ Coonfield Trucking LLC"
“I started trucking in 1973. If I'd started with Jones Motor then I would be retired right now. I trucked with Randy Sutton when he was an O/O in the early 1990's. We lost track for a while and when we ran into each other again in January of 2000 Randy had joined the Jones team. After seeing the rates and amount of freight, I couldn't sign up fast enough. In 2004, I was selected Overdrive Magazine's Driver of the Year. While attending truck shows and talking with drivers, I give Jones Motor all the credit for my success. We have good rates, fuel surcharges and we make money. We are very happy with the family atmosphere at Jones Motor. What it all comes down to is "Run with the best and good things happen".